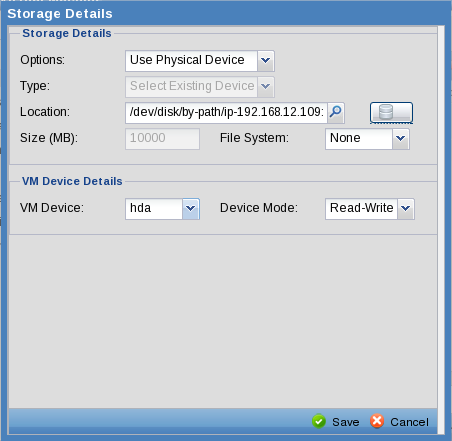 ConVirt allows you to declare your storage and use it for Virtual Machines. It supports both direct attached storage as well as shared storage topologies. For direct attached storage (local disk or LVM), you do not need to anything specific, you can simply provide the full disk location at the time or provisioning. For shared storage, you need to declare it at the Data Center level and then assign it to one or more server pools. Once this is done, you can create disks on the shared storage. Moreover, ConVirt keeps track of the storage usage and presents it on various dashboard. This gives administrator an opportunity to fix storage capacity problems before they occur. 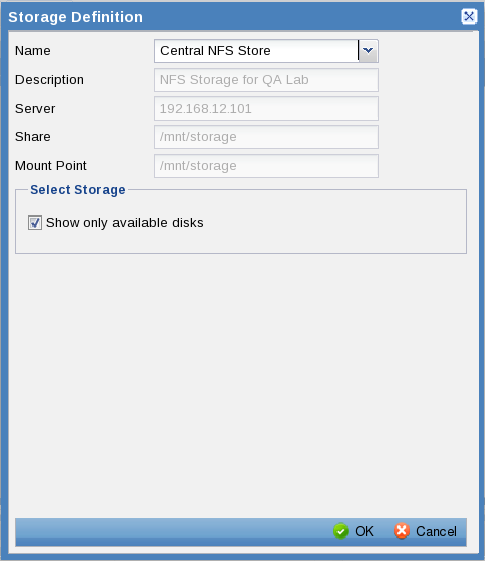 Here is step by step example of creating and using NFS Storage. 1. Select Data Center from the left navigation tree. Right-click and select Manage Storage. NOTE The shared storage should already be setup correctly on each managed server that needs access to it. 2. Right-click and select Manage Storage. This will bring up a list of all storage already associated with the server pool. 3. To associate a newly create storage, click the "Attach" button. This will bring up another dialog showing all defined storage. 4. Select "Central NFS Store" from the list and press "Associate" button. Once the storage is associated with the Server Pool, it can be used to provide disks to Virtual machines at the time of provisioning. 1. Select a server from a QA Lab. For example, srv-001. 2. Right-click and select provisioning. 3. Select "CentOS_54" Template from Common Template group. 4. Enter a name for the Virtual Machine. 4. Select storage area and select the first disk. Click on the Edit button. This will bring up the Storage disk detail dialog. 5. Click the Storage icon next to the location. This will bring up a dialog containing all storage available to this server. 6. Select "Central NFS Store" defined previously and press OK.
7. Notice that the location now reflect the mount point of the storage. 8. Press OK to kick-off the provisioning operation. 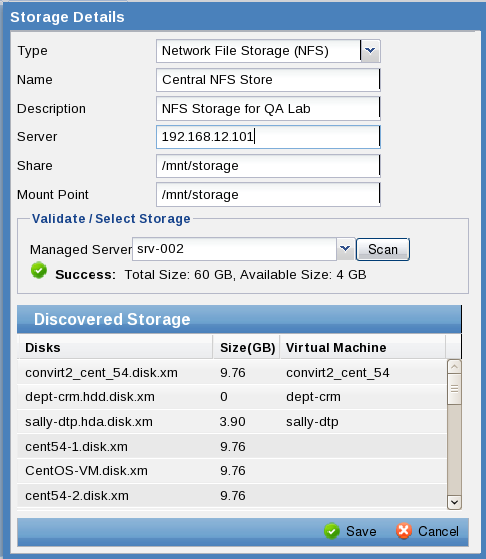 This will create new disks on the selected "Central NFS store"
ConVirt allows using the iSCSI storage for VM disks. Once declared, ConVirt keeps track of each Luns. Each Lun can be used as Virtual Machine disk at the time of provisioning. This is same operation for any storage type. Please refer to NFS storage section for this. For the Enterprise version, ConVirt will setup iscsi initiators on all managed servers within the pool. 5. Select User Physical Device from the Options dropdown. 6. Click the Storage icon next to the location. This will bring up a dialog containing all storage available to this server. 7. 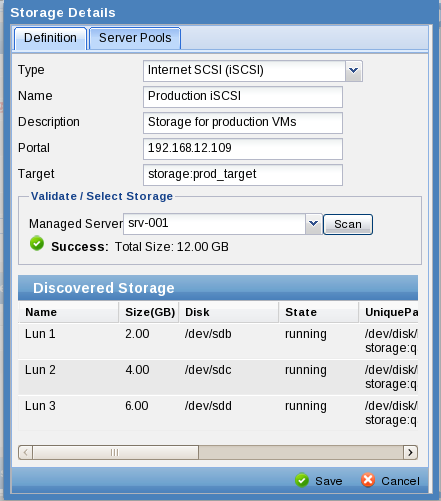 Select iSCSI storage defined previously. Select a Lun from the list below and press OK.
7. Notice that the location now reflect the unique path to the Lun selected. Press OK to save the disk details. 8. Press OK to kick-off the provisioning operation. This will use the Lun as a disk for the VM.